Background: This mural is a tribute to Joliet's deeply rooted Irish heritage. It uses a montage-like sequence and realistically rendered details to illustrate how Irish men and women have contributed to the history and character of Will County since the 1830s. The upper left side of the mural depicts the harsh living and working conditions in Ireland of the mid-nineteenth century. Women are shown toiling in a potato field, superimposed over a ribbon of the country's orange, white and green flag. Irishmen are digging the Illinois and Michigan Canal and working in the local limestone quarries. These industries spurred the early growth and development of Joliet. The Irish workers toiled long hard hours at low pay and in dangerous working conditions. 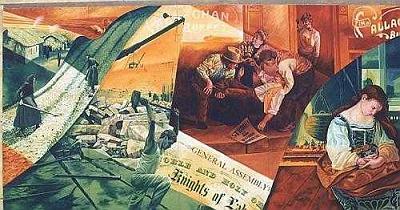 The mural's dramatic centerpiece, which shows a quarryman shot dead during a quarry strike, pays homage to the major role that local Irish had in organizing labor unions and in fighting for workers' rights. In 1876, Irish-Americans helped found the Noble and Holy Order of the Knights of Labor of America in Chicago, the nation's most dominant labor organization of the 19th century. In Joliet, the Knights represented steel and stone quarry workers, including unskilled workers, women and minorities. While portions of the mural show how the history of the Irish in America included much struggle, it also is a testament to the Irish-Americans' enduring faith in home, family and church. The right hand section of the mural shows a woman praying by her hearth as the old St. Patrick's Church, formed in 1839 by newly arriving Irish as Joliet's first Roman Catholic parish, can be seen across the street through the window. For more information on this or any other artwork in Joliet, please contact Friends of Community Public Art at (815)722-4140 or visit www.FCPAonline.org.